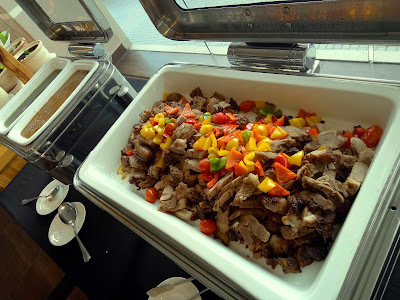 Special thanks to Ixora Hotel for extending this food review invitation. Ixora Hotel is one of the few hotels within close proximity to the Perai Industrial Estate. Located next to Megamal Pinang, the 4-star hotel enjoys a constant influx of guests owing to its strategic location. The Straits Cafe & Lounge is the main restaurant here. 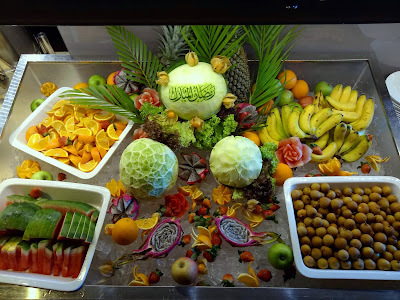 I am fortunate to join Ixora Hotel's preview of its upcoming Ramadan buffet offer. The dinner theme this year is "Citarasa Desa Ala Pak Nass". 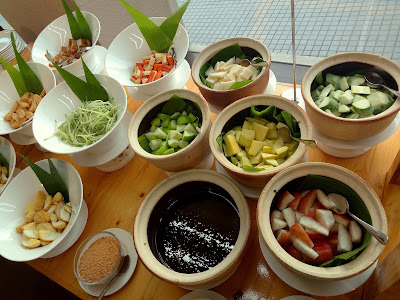 "Pak Nass" refers to Ixora Hotel's Malay chef, who is the architect behind many signature dishes this evening. The menu features countryside-style cooking with emphasis on fresh ingredients. Ixora Hotel's Kambing Panggang Golek remains the highlight every year and will be available daily throughout Ramadan. Unfortunately for today's preview, delivery of mutton was late so there was insufficient time to do proper marination. This explains why grilled lamb leg is served instead. 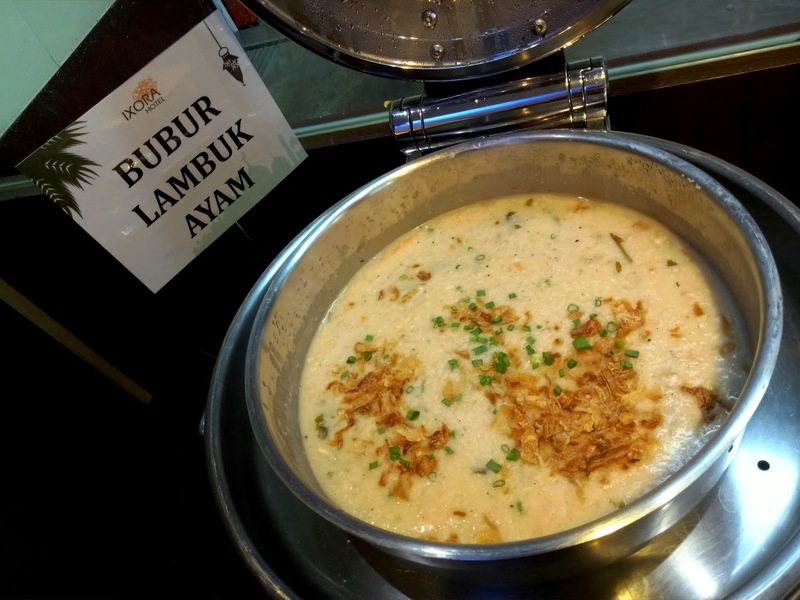 Bubur Lambuk Ayam is an essential dish during iftar meals. The porridge is cooked until the rice grains have mostly disintegrated into the soup, forming a thick paste with flavorful flavors of chicken and spices. 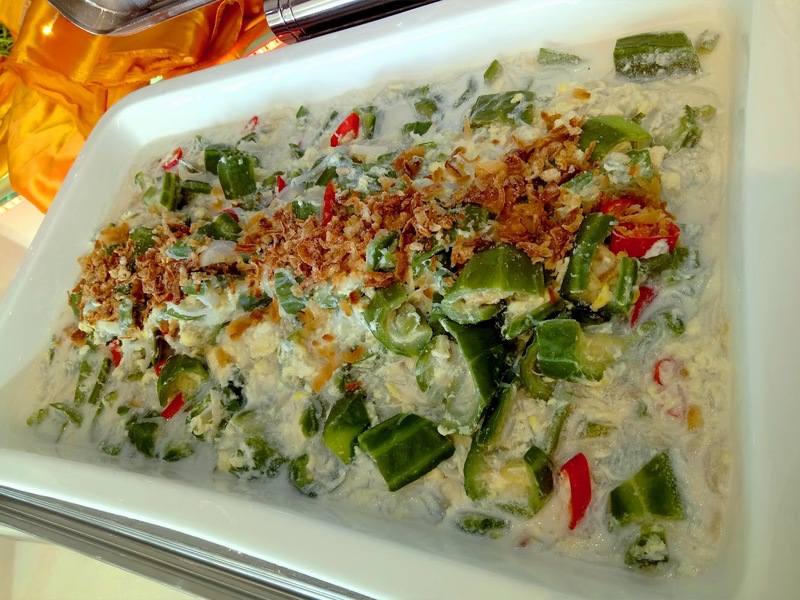 In fact, this is one of the finest Bubur Lambuk recipes that I have tasted this year. 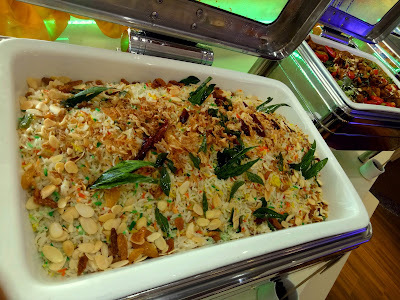 Nasi Minyak Pelangi uses long-grain basmati rice, which has a loose texture and does not feel so surfeiting. The rice is flavored with a variety of spices and garnished with almonds and fried shallots for extra crispiness. By the way, the word "pelangi" means "rainbow". This refers to the fact that some rice grains are dyed in a manner similar to Nasi Hujan Panas. 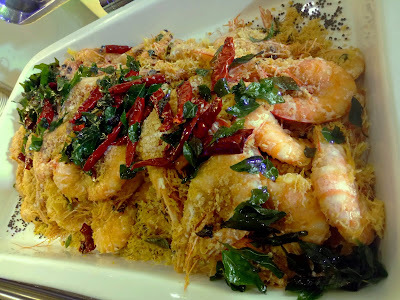 Udang Goreng Nestum Daun Kari is a popular dish for many people. The deep-fried shrimps are coated with crispy multigrain cereal. Not only is the coating sweet, it is also rather appetizing. Meanwhile, curry leaves and dried chilies help to enhance aroma. 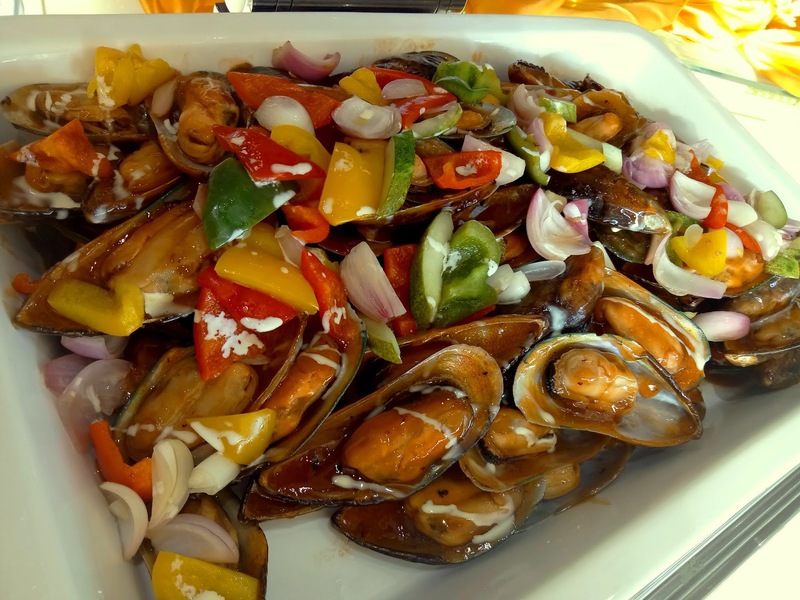 Next, Kupang Masam Manis uses large mussels from New Zealand. The mussels are dressed in tangy sauce, and then garnished with cucumber, capsicum and shallots for the aesthetic appeal. Masak Lemak Petola, Suhun & Telur is a unique dish indeed. It uses a special type of cucumber called luffa. Its soft texture is reminiscent of eggplant. Besides glass noodle and eggs, the dish also comprises of creamy gravy made from coconut milk. 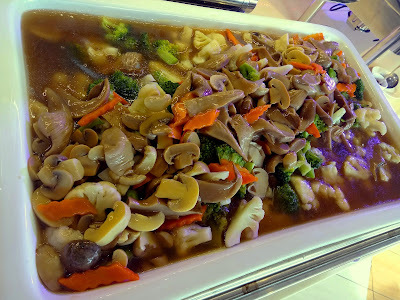 As for mixed vegetables, Sayur Campur Cendawan Sos Tiram consists of button mushrooms, straw mushrooms, broccoli, cauliflower and carrots. Oyster sauce is what binds all ingredients together. 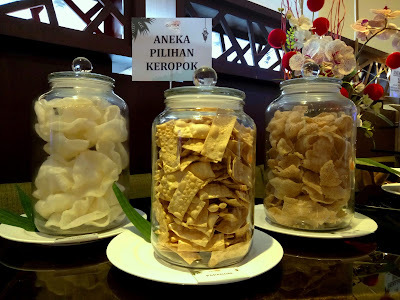 Diners can also indulge in several types of keropok (crackers) such as fish crackers, prawn crackers and papadum. The crackers are sealed in airtight jars to ensure that they remain crispy. 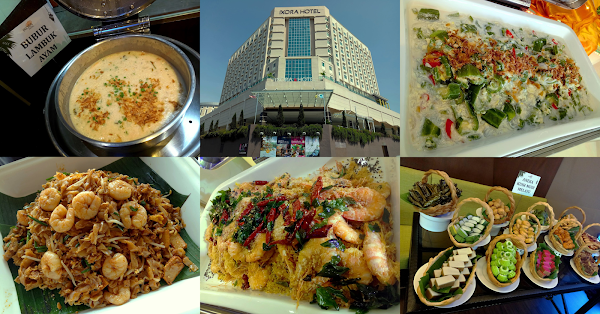 Ixora Hotel's Ramadan buffet also features several live cooking stations including one which serves Penang Char Koay Teow. 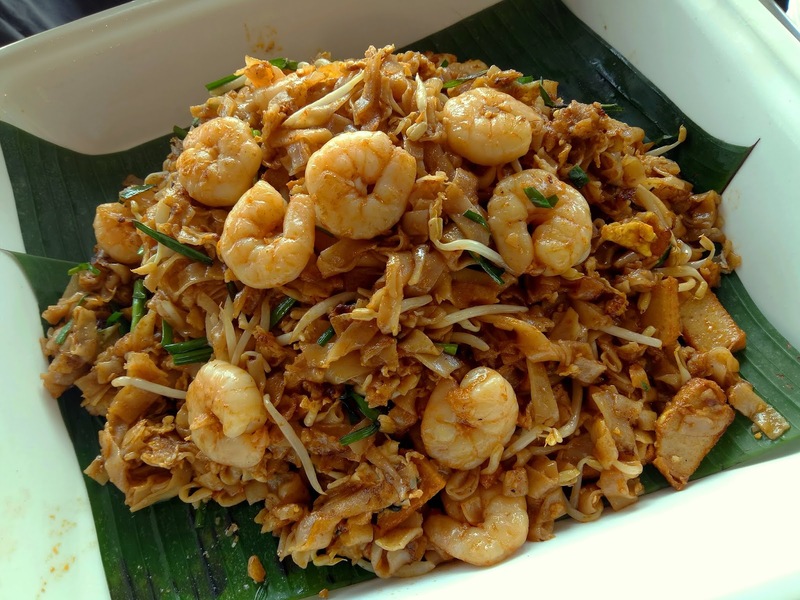 The flat rice noodles are cooked with large shrimps, fishcake, egg, bean sprouts, garlic chives, chili paste and garlic. Overall, I am quite impressed with the cooking. 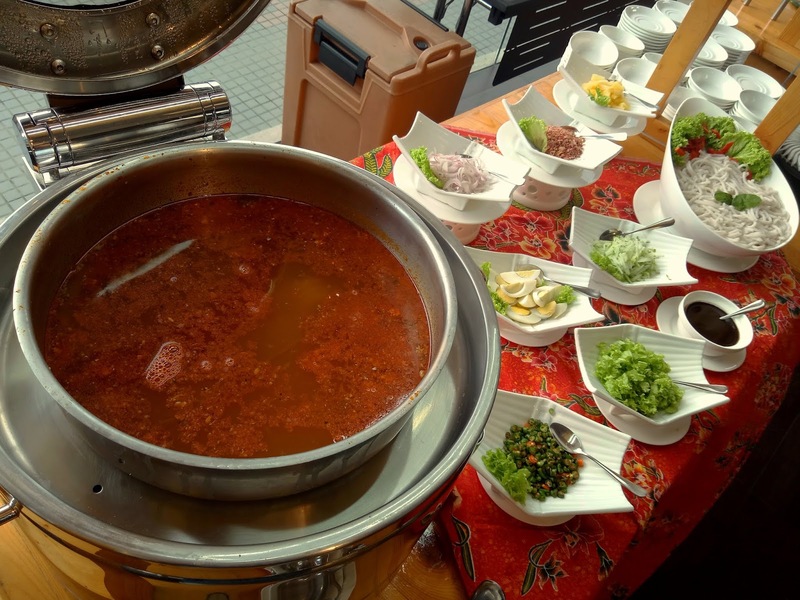 Asam Laksa is another iconic dish of Penang. The key to this dish is the rich broth, which is made from fish, tamarind, chili peppers and other spices. The sour-and-spicy broth is frequently served with thick rice vermicelli, pineapples, cucumbers, shallots, lettuce, bunga kantan (torch ginger), bird's eye chili and shrimp paste. Rojak Buah-Buahan (fruit salad) is a mixture of cubed fruits like jambu air (rose apple), sengkuang (jicama), unripe mango, green apples and cucumber. Meanwhile, the thick dressing is made from savory shrimp paste (belacan). A light sprinkle of crushed peanuts provides an extra crunch. Another salad dish, Penang Pasembur, is also available. Ixora Hotel offers a surprisingly wide variety of traditional Malay kuih. 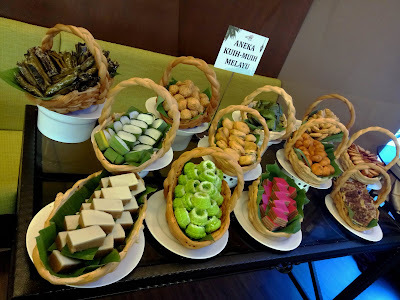 Presented in nice rattan baskets are popular ones such as kuih talam, kuih lapis, puteri ayu and cucur badak. In addition, guests can also help themselves with several types of biskut raya (festive cookies). 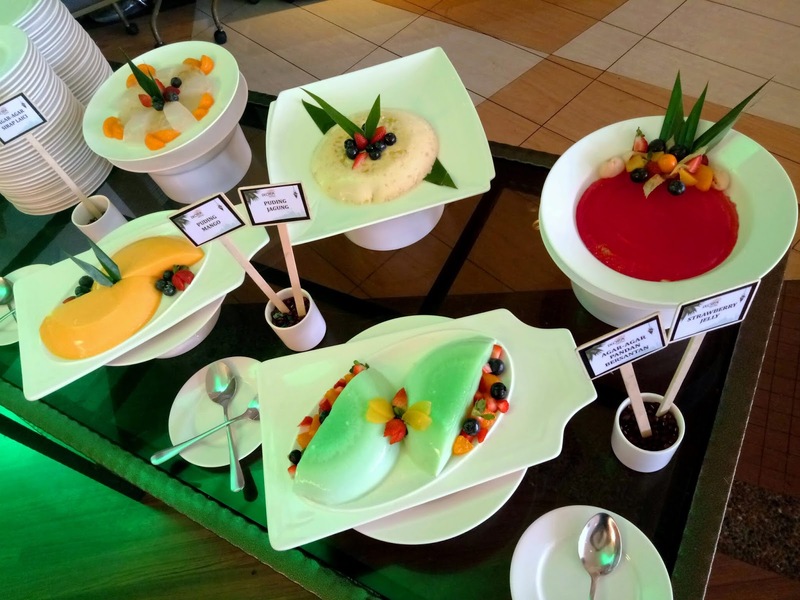 Strawberry Jelly, Agar-Agar Pandan Bersantan (pandan jelly with coconut milk), Agar-Agar Sirap Laici (lychee syrup jelly), Puding Jagung (corn pudding) and Puding Mangga (mango pudding) are also prepared today. However, I personally prefer them to be less sweet. 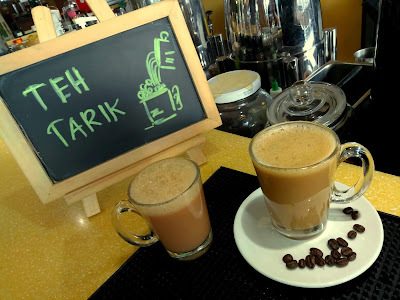 Teh Tarik is probably the most recognizable Malaysian drink. To prepare this drink, hot milk tea is "pulled" between metal containers to make it frothy. Nescafe Tarik is also prepared in a similar manner. Last but not least, there are several dispensers that contain iced drinks like soy milk and sirap bandung (rose-flavored milk). Ixora Hotel's Ramadan buffet dinner is served from 21 May 2018 to 14 June 2018. 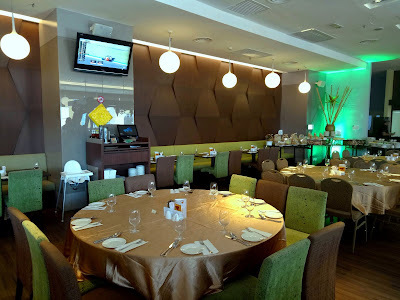 Dinner is priced at RM86.00 for adults and RM56.00 for children between ages of 4 and 12. For each party of 10 full-paying adults, the 11th person dines for free. In addition, the hotel is also having a separate buffet session in the Baba & Nyonya Ballroom. Directions: From Lebuhraya Utara-Selatan (North-South Expressway), take the Prai exit and head west. 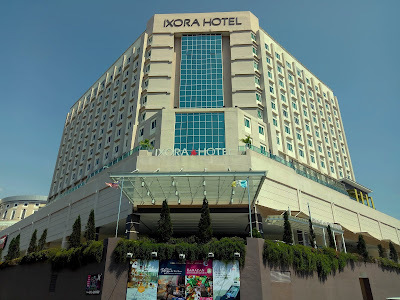 After Megamal Pinang on the left, turn left and follow the road to Ixora Hotel's basement parking. The Straits Cafe & Lounge is located next to the lobby.